TDVP - Episode 146 - "Unicoi Pt. 5"
The third season of "Dulcimerica" wraps up with a five-part look at the NGFDA Fall Festival at Unicoi State Park Lodge in Helen, Georgia. In part five, musical performances by Guy George, Joe Collins and a finale from Bing Futch, Ken Bloom and Keith "Two-Sticks" Davis. TDVP - Episode 145 - "Unicoi Pt. 4"
In part four, musical performances by Linda Brockinton, Bruce Ford and Anne Lough. TDVP - Episode 144 - "Unicoi Pt. 3"
In part two, musical performances by Agene Parsons, Jeff & Janet Furman and Bill Taylor. TDVP - Episode 143 - "Unicoi Pt. 2"
TDVP - Episode 142 - "Unicoi Pt. 1"
In part one, a tour of Helen, a look around the lodge and musical performances by Wayne Seymour, Pam & Terry Lewis and Mike & Connie Clemmer. 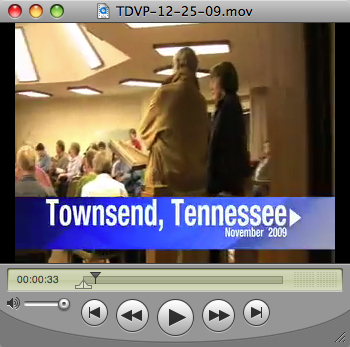 TDVP - Episode 141 - "KADC Retreat"
From Townsend, Tennesee in November, a sampling of performances from the Smoky Mountain Dulcimer Retreat including Bill Taylor, Mike and Connie Clemmer, Jim and Cherie Miller, Anne and Rob Lough and more! 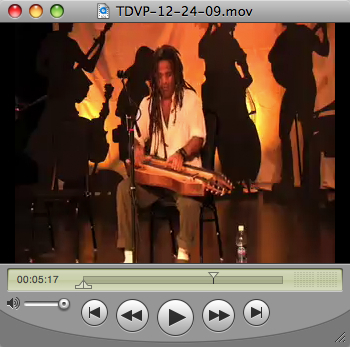 Bing Futch performs a medley on mountain dulcimer consisting of "Booth Shot Lincoln/Old Yellow Dog/Old Joe Clark." TDVP - Episode 140 - "Chautauqua Pt. 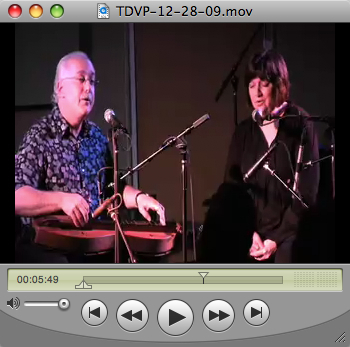 2"
From New Harmony, Indiana and the Chautauqua On The Wabash festival - Bing invites one of his students, Diana Mahrenholz, up on-stage to perform a blues improvisation on mountain dulcimer before playing his rendition of the Appalachian mountain tune "Cluck Old Hen." TDVP - Episode 139 - "Chautauqua Pt. 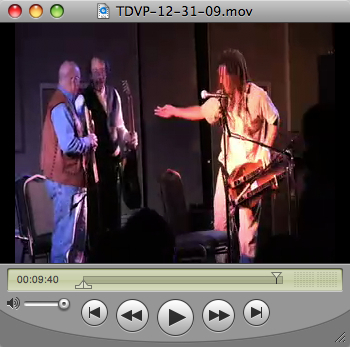 1"
From New Harmony, Indiana in October 2009 - a look around the Chautauqua On The Wabash festival featuring snippets of performances from Tull Glazener, Dave Haas, Guy George, Alan Darveaux, Heidi Muller, Bob Webb, Sarah Elizabeth, Cathy Barton, Dave Para and more. Those of you who follow The Dulcimerica Video Podcast know that I've slowed down the posting of podcasts in the final quarter of this year. That's mainly due to how mind-boggling busy I've been, not only with fall gigs, but also with preparation for the Key West Dulcimer Fest. There is another reason which I hesitate to mention, but since it seems that I may be the last person on the internet to actually put voice to this reason, then I've held on tenaciously. Earlier this year, a "Donation" button quietly appeared on this site along with a suggested tagline to encourage donations. (I won't mention whose idea this was - but they are a highly respected member of the dulcimer community.) The bottom line is: the podcast is a labor of love, begun three years ago and maintained with alarming consistency where most new podcasts begin to appear erratic after six months. To produce a single episode (there are over 130) takes approximately eight hours; from shooting the footage to logging it into the computer, editing it together, compressing it into form for the web, uploading it to two sites (sometimes three) and maintaining the archives. With my YouTube page, this is cost-free. With the official Dulcimerica page, all of the movie files are stored on my server. More than once, I've had to delete files (in one case, all of the AFI Radio podcasts) in order to make physical room for the increasing number of videos and my ISP has threatened to shut me down due to the enormous amount of bandwidth I use. It's a private server which I've had since 1994 and I'm afraid I'll need to go with a public ISP due to the huge hits that Dulcimerica gets. Add to that the cost of videotape, camera maintenance and supplementary gear and it all adds up. For a while, I considered putting Dulcimerica behind a firewall and charging a nominal fee for access, but decided against it, choosing instead to place a donation button on the site. Problem is, not a single donation has ever been made. Granted, I've never pointed out the fact that there's a donation button in existence (it's tucked into the right margin just under the subscription buttons) and many people who subscribe to the show either do it through iTunes, another podcatcher or watch it on YouTube. The reason I mention this now is, as you know, we're living in tough economic times; not terrible, but enough to make everyone cinch up their belts a tad. As I head into a fourth year of producing Dulcimerica, I'd like to revamp a few things, put more time into instructional episodes, creating graphics and supplementary materials for the podcasts. This, of course, will take time, materials and server space as well as bandwidth. Many thousands of people have viewed Dulcimerica on YouTube and via Blogger, enjoying the song demos, instruction, tips and workshops, road trips and interviews. The podcast has over 1600 subscribers! If everyone donated between $2 to $5, it would very nicely help to support and preserve the show as well as our extensive archives. Please consider making a donation - it would go a long way towards development of what has become a fixture within the dulcimer community. 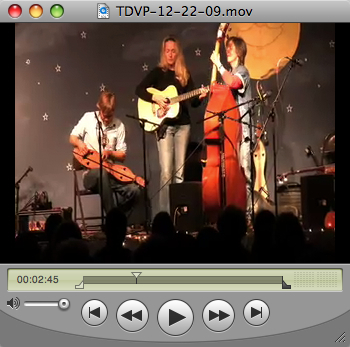 I'm currently knocking out the remainder of footage from 2009, beginning with the post above from the Winter Creek Reunion. 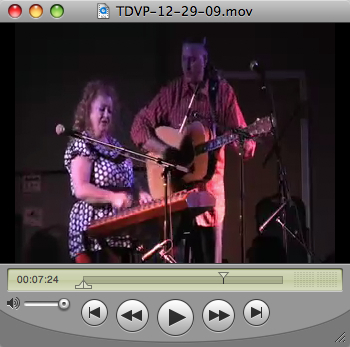 Before the end of the year, footage from New Harmony, Smoky Mountain Dulcimer Retreat and Unicoi will go up. After that, I'll be revamping the opening credits (including the show's new name, which will be simply "Dulcimerica".) Carla Maxwell, who has held the Dulcimerica.com domain name since before the show existed, has lovingly re-directed the domain to the main website - so you can now type Dulcimerica.com and it will take you to the Blogger site. This will not effect subscriptions via iTunes or any of the podcatchers out there. 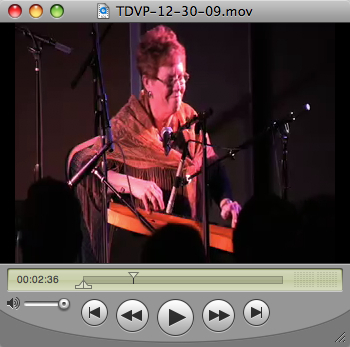 I'll be kicking off the new year with some instructional videos, quickly followed by road trip episodes from Kentucky Music Winter Weekend, Winter Dulcimer Fest, NAMM Show and the Key West Dulcimer Fest. New graphics and format will be introduced as well. It's my aim to return to four times a month and more if the event calls for it. Even if you're not a PayPal member, you can still make a donation by following the link at the bottom of the screen. Thank you for allowing me to make a telethon post here - I will more than likely do the same through the podcast as well. Your contribution is very much appreciated! TDVP - Episode 138 - "Winter Creek Reunion"
Bing travels to Bennington, Oklahoma in October of 2009 to perform and teach at the Winter Creek Reunion. David and Annette Lindsey, Margaret, Lloyd and April Wright, Cathy Barton and Dave Para, Russell Cook and more are featured on mountain dulcimer, hammered dulcimer and other instruments. 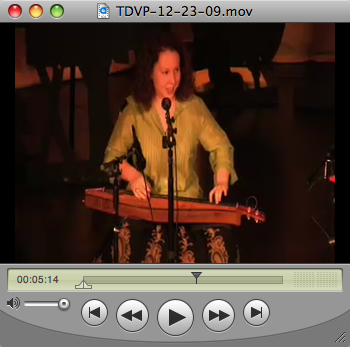 An introduction to the 1st Annual Key West Dulcimer Fest - taking place January 28th - 31st, 2010 in Key West, Florida! 15 world-class musicians will perform in concert and teach workshops in mountain dulcimer, hammered dulcimer, steel drum, pennywhistle, autoharp, guitar and more!